Karma Kitchen was first opened in Berkeley, California in 2007 by volunteers inspired to seed the value of a gift economy. 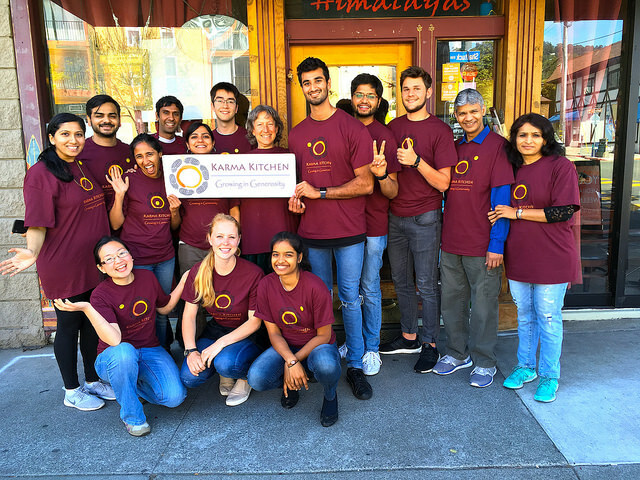 Karma Kitchen has served over 74,700 meals and generated over 60,300 volunteer hours in Berkeley alone, but ultimately, it’s impossible to measure all the ripples. Since its first iteration, Karma Kitchen has spread around the globe to 26 locations worldwide, sustained by the goodwill of any and all who want to uplift the power of generosity. Audrey Lin, a coordinator of Karma Kitchen in Berkeley, shares more about the restaurant’s inspiring principles, mission, and impact. What sparked the founding/creation of Karma Kitchen? Why is Karma Kitchen described as an “experiment”? Karma Kitchen was started by a group of friends who were inspired to engage in small acts of kindness and grow in the spirit of generosity. The joy of giving became contagious, and they wondered what other forms it could take. In 2007, the first Karma Kitchen opened in Berkeley, California, as an experiment to seed the value of a “gift economy” – an economic system where goods and services are given with no strings attached. Karma Kitchen is described as an “experiment”: on one level because it will continue only as long as the community finds value in it and on another level because it’s an invitation to see what happens when we tap into our own potential for generosity. 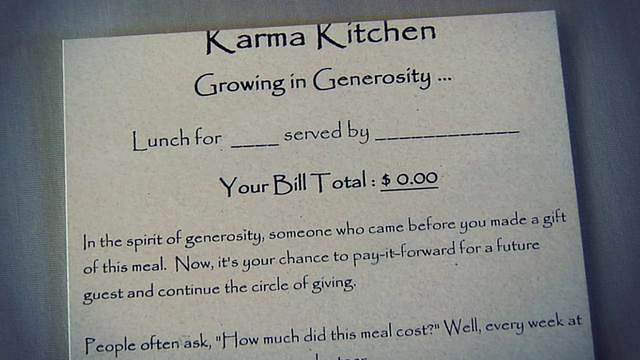 Guests receive a bill at the end of the meal that reads $0.00, and they’re invited to pay forward whatever amount they wish to offer guests who come to the next Karma Kitchen. So if the guests find value in Karma Kitchen, their collective contributions pay for the costs of the next Karma Kitchen. Volunteer hours also make the experiment happen — if people are moved to serve in this way. Beyond that, there are so many other forms of wealth that can’t be quantified in the process but that certainly make Karma Kitchen what it is. Each time Karma Kitchen runs, we can’t predict what’s going to happen. There are best practices and general processes that volunteers around the world have used to implement it in their communities. But every time, a different group of volunteers comes together and a different group of diners walks through the door, so it is best not to have the model too standardized. Volunteers come with an intent to grow in the spirit of generosity – to spend a day spreading smiles. But there’s no formula for making someone smile or for being moved by gratitude. Inner transformation is something that can’t be copied and pasted, so every Karma Kitchen is different, and it’s a living experiment – everyone involved tunes into opportunities to engage in radical acts of generosity and sees what emerges. In the Karma Kitchen process, so many beautiful moments have unfolded. One time, a guest mentioned her favorite cake (which we didn’t have), and the volunteer bought a slice of it down the street and surprised her with it! Another time, there was a line out the door, and a couple didn’t have time to wait but were so moved by the concept that they gave the maître d’ a 20-dollar bill to pay it forward! At a Karma Kitchen in Poland, when the volunteer crew learned it was a couple’s anniversary, guitars were swiftly brought out and everyone sang an impromptu blessing for them. Strangers blessing strangers – the visceral experience of that strengthens a person’s faith in humanity. Karma Kitchen is an experiment to unlock that spirit. 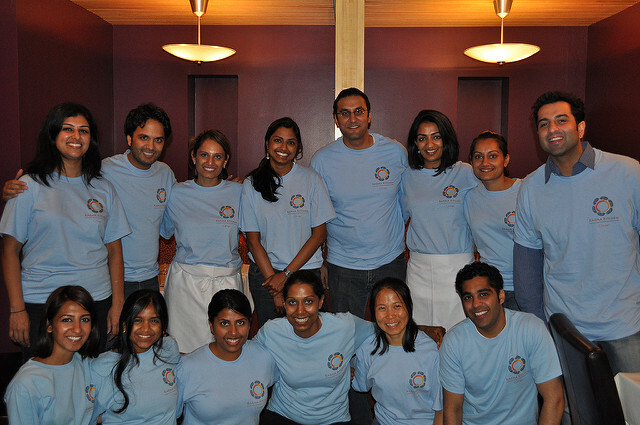 How does Karma Kitchen contribute positively to society? Karma Kitchen is a space that shifts our cultural paradigm from one of consumption to contribution, from transaction to trust, from isolation to community, and from scarcity to abundance. In a market economy, the assumption is that we go into situations looking at what we can get out of it. But a gift economy experiment like Karma Kitchen flips that assumption on its head. The gift economy creates a container for selfless service to flow through – and when people walk into that circle of giving, they find themselves moved to find a way to contribute. 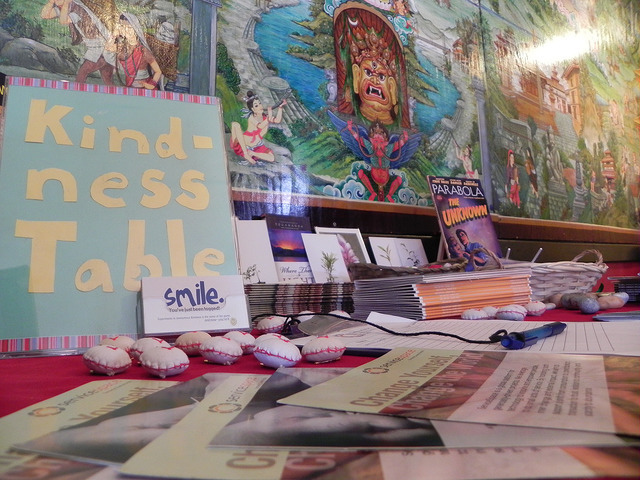 At Karma Kitchen, people have offered stunning songs or crafted beautiful handmade cards to put on our “Kindness Table” (a table of gifts where people can take for themselves or gift to other). Corporate groups have signed up to volunteer. An elementary teacher brought her students who gifted notes of well-wishes to people around the restaurant. 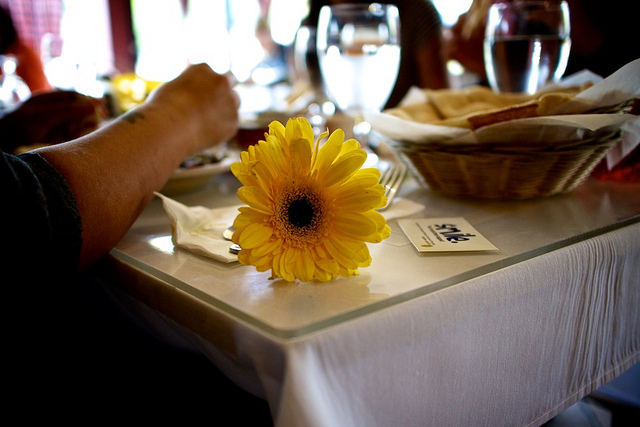 There’s often a “Community Table” where people can choose to dine with others they don’t know. I often think of Karma Kitchen as a generosity gym. It’s an environment where people naturally find themselves being kind – and that consistent practice then spills over into the rest of the week; over time it becomes a habit. And when a community comes together around this energy, the ripple effects in society are immeasurable. How do you see Karma Kitchen as embodying/being related to grateful living? 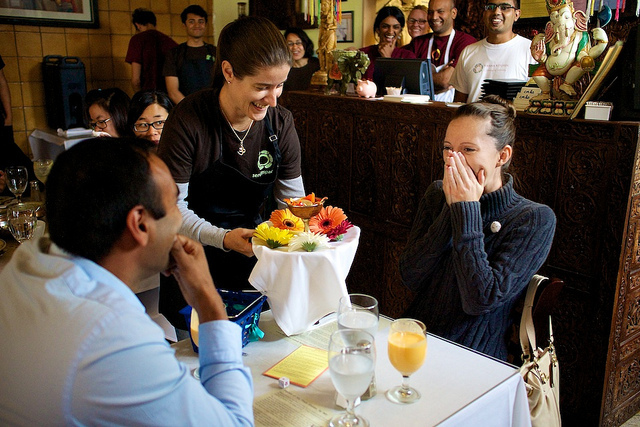 The pay-it-forward restaurant experiment puts people in a position to receive kindness from strangers – the unknown faces who came before and paid for a meal, the volunteers spending their day serving diners, the open presence of others in the restaurant, the efforts of invisible volunteer coordinators, and so much goodwill from the broader community. Receiving all that can be disarming. It invites people to see with “new eyes” – to look at lemons and instantly see the lemonade; to tune into forms of value that were right in front of us, but that we didn’t have eyes to see before. That process, in a way, is paramount to grateful living. How does Karma Kitchen inspire gratefulness? The guest was blown away! Actually, they were both blown away because these things rarely happen in real life. But why shouldn’t they? After the exchange, people were so moved. Someone posted the story online, which has spurred a beautiful chain reaction of sorts. In the years since, many people have literally and effortlessly been inspired to gift the shirt off their backs or the item in front of them when someone compliments it. That depth of generosity is actually an age-old practice. An Iranian volunteer later informed us there’s a word for it: pish-kesh. A funny side-note is that this practice became so common in the community that now there’s a running joke amongst some, which is that guests have to say, “I like that shirt – on you!” so as to ensure that the person wearing it keeps it. This form of giving is like reverse free-loading. What inspires people to participate — as volunteers, partner restaurants, and diners — in Karma Kitchen? What kind of response do you receive from diners? Is the zero-dollar check a surprise to anyone? We receive all kinds of responses. The zero dollar check is often a surprise for first-time diners. Folks often do a double-take, and then as you explain the concept to them, there’s a feeling of awe that kind of fills the air. In a market economy where businesses constantly advertise how much we lack, this setting reminds us that the reverse is true: We have everything we already need, and our greatest wealth is our capacity to give. Of course, everyone responds differently. One time there was a man who just wanted a meal. Volunteers explained the Karma Kitchen concept, and he replied, “Okay, you guys can do whatever you want, but I just want to eat lunch.” He took a seat and had his meal. At the end, he received the zero-dollar bill. He took out his wallet and called the server over. “You guys trust me to pay it forward. Alright. I trust you to bring back the right change,” and he gave the server a 100-dollar bill. The server had no idea what to do. It was his first time volunteering at Karma Kitchen, and no one had alluded to any scenario like this during the volunteer orientation. He was a PhD student in computer science and started running through the “use cases” in his head: “Should I split it 50-50? Should I estimate how much his meal would have cost and give him back the rest?” Then, he stopped. He tapped into the place inside himself that inspired him to volunteer at Karma Kitchen to begin with. And he got an idea. He grabbed his wallet and pulled out a $20. He went back to the guy and gave him $120 in change. In that moment, they both felt that effortless flow of generosity, and they both were disarmed by it. When we serve with no strings attached, it gives rise to a remarkable sense of interconnection and the resulting capacity of the human heart surprises, humbles, and connects us to ourselves and each other. …the resulting capacity of the human heart surprises, humbles, and connects us to ourselves and each other. How do participants carry their experience at Karma Kitchen out into the world with them? What is the lasting impact? One core principle that fuels Karma Kitchen can be described in this quote from Gandhi: “Be the change that you wish to see in the world.” What I mean by that is while Karma Kitchen is a concrete expression of gift economy, it is — at its core — a group of rotating volunteers who hope to deepen their own experience with and capacity for generosity, with the belief that when we change ourselves, the world also changes in tangible and intangible ways. When we collectively do that, who knows what new patterns of positive deviance can unleash in the world. Some participants have started different pay-it-forward experiments in their own communities. For the last few years, a middle school teacher has been assigning students in her service-learning class to host a pay-it-forward pop-up restaurant as their final project. A recent college graduate gathered a crew of friends to celebrate his 23rd birthday by doing 23 acts of kindness. One doctor who volunteered all day washing dishes is pioneering a pay-it-forward medical practice. People open up their homes to host community dinners. Ultimately, we hope to unleash a worldview in which priceless gifts — like gratitude, generosity, and compassion — can more widely circulate. There are countless micro-moments that ripple out in seen and unseen ways. I remember after the first time I volunteered at Karma Kitchen, I noticed the walls I typically put up between myself and others dissolved just a little bit. I started looking at strangers as someone’s mother, father, sister, or brother — rather than as an unknown face carrying unknown motivations. I’d find myself happily doing dishes in a workplace kitchen, or surprising a friend with a small gift I knew they’d enjoy. 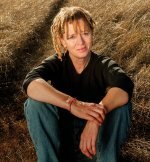 The more I volunteered, the more the practice of generosity became a habit – and it becomes a virtuous cycle in which my cup of gratitude spills over someone else’s cup, which spills over another’s cup and eventually, we’re all “fighting” to do each others’ dishes, literally and metaphorically. What are some of the common barriers and obstacles that arise for Karma Kitchen? How are they addressed? People sometimes come to Karma Kitchen with a free-loading mentality: a place where they can get a “free” meal. But if everyone comes just for a free meal, the experiment doesn’t sustain. However, if we’re genuinely tapping into agendaless service, this doesn’t happen because it’s a natural principle that when a person’s cup overflows with gratitude, it naturally spills over to the next person, and the next…We trust this principle. If people are moved by the spirit of generosity they experience at Karma Kitchen, they naturally will want others to have an opportunity to experience it, and they pay-it-forward however they can, whether by financially contributing, volunteering in the future, doing an act of kindness for someone else, or all three or something else entirely. Research actually supports this principle. Some years ago, researchers at UC Berkeley’s Haas School of Business conducted a study at Karma Kitchen, and they found that people paid more when paying for others. We don’t give people a ‘suggested amount’ to pay forward; we don’t track how much each guest pays forward for future guests. We just trust that if we are truly aligned with the spirit of selfless service and generosity, then not only will guests’ collective financial contributions toward each Karma Kitchen be enough to cover costs for the next time, but beyond the financial capital, so many other forms of wealth are generated in the process. The zero dollar check is often a surprise for first-time diners. How does Karma Kitchen plan to grow? Ultimately, we just hope to grow in generosity. How can one measure the impact of any number of smiles? We don’t have a plan to start a certain number of Karma Kitchen chapters around the world. Of course, when people are moved to start a Karma Kitchen, we’re happy to support them because we’re moved by their intention to deepen in service and to nurture values of kindness, gratefulness, and generosity in their local communities. But if Karma Kitchen stops operating in various cities, for whatever reason, that’s great too. Maybe some other “experiment” that wants to be born will be more suited for that context. We’re just happy to have the opportunity to be of service and to support that spirit in others in whatever expression it emerges. If you could encapsulate one message for people who participate in Karma Kitchen, what would that be? 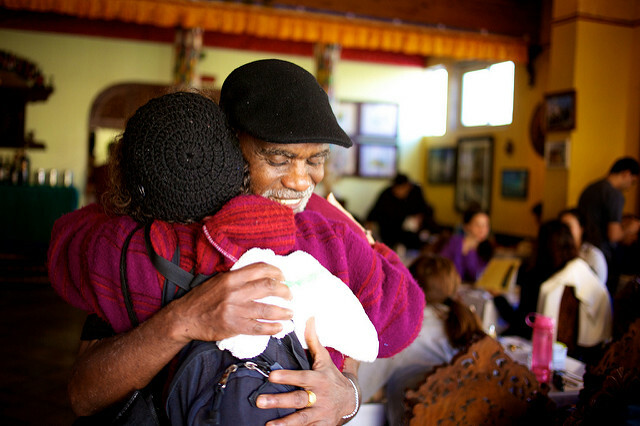 One of our Berkeley coordinators Elizabeth Pimentel-Gopal sums it up with gratitude: “Thank you for creating ripples of kindness, love, community, trust, compassion in our planet.” As our acts of giving transform us, the line between who is the giver and who is the receiver begins to blur. It’s a tremendous gift to have the opportunity to be of service, to receive so much presence and goodwill, and to trust the seeds of generosity sown will take root and bloom however they are meant to. If Karma Kitchen could share one message about living gratefully, what would it be? When we start to see the invisible gifts embedded in so many facets of our lives, we can’t help but pour it forward, and that spirit of service becomes a natural expression of grateful living. In one world, there’s a big banquet on the table. Around the table, there are all these people, and the only utensil they have to eat the food is long spoons. Everyone at this table is miserable. They’re malnourished, they’re cranky, they’re really upset, and they’re fighting with each other because the spoons are so long that they can’t reach their mouths if they try to feed themselves. They miss and hit the wall. Then, in another world, the same table is there and the same feast and the same long spoons. In this world, though, people are beaming with joy. And they’re well fed. In this world, they scoop up the food and feed each other, because they can’t reach it to feed themselves but they can reach another’s mouth. For me, this work is like those long spoons – it is an avenue to realize the incredible abundance that lies within us when we are able to simply give. To learn more, visit Karma Kitchen. Syndicated from Gratefulness, the online magazine of the A Network for Grateful Living. This is a global organization offering online and community-based educational programs and practices which inspire and guide a commitment to grateful living, and catalyze the transformative power of personal and societal responsibility. Your pain is my pain, My wealth is your wealth, Your salvation is my salvation.